DRAWN IN: Marlene Palagyi has a watercolour and ink painting similar to this in the Central Coast Art Society Summer Exhibition, and will run CCAS's first workshop for the year. MARLENE Palagyi remembers very well what it's like to start out in art and to enter your first show, having taken up watercolour painting seriously just 11 years ago at 58. These days she's a recognised talent on the Central Coast, teaches workshops, has won a number of awards and exhibits regionally and in Sydney, including three works entered in the Central Coast Art Society's Summer Exhibition. The annual exhibition and awards began on Friday (January 18) and run until January 23 at Gosford Regional Gallery, with a diverse range of paintings from traditional to abstract, varied media, as well as jewellery and cards, unframed and miniature paintings. "It's very nerve-wracking, especially the first time, to put your work out on display for someone else to see and to judge," Marlene said. "You look at other people's work and you think 'oh, mine's not good enough', and then you see it hanging with them and you see it's not actually out of place. "Then you start to get compliments and to sell pieces and your confidence grows." When Seniors News spoke to Marlene she had just finished her third piece for the exhibit, a watercolour called The Birch Forest, which will accompany a pen and wash piece of Port Isaac in Cornwall and a floral watercolour and black ink. A former teacher, Marlene said she had always enjoyed sewing and craft and wanted to explore art when she retired, which is exactly what she did. She started with a drawing class, before trying different media, but when her husband, George, gave her a week's watercolour class for her 60th birthday, she fell in love. "I just loved what people can do with watercolour; I wanted to learn how to how to build colours and to make that soft transparency happen," she said. 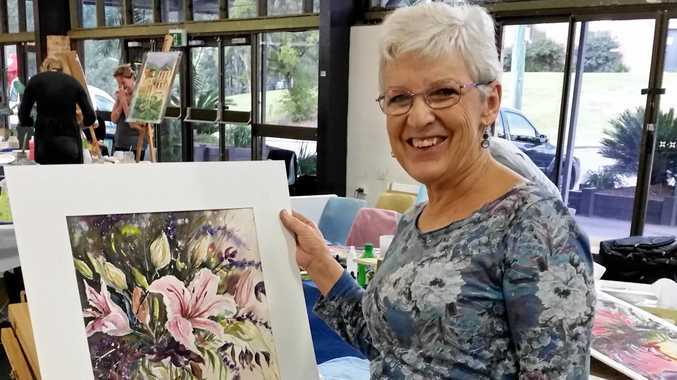 Having sought out a teacher, Judith Hoste, now CCAS president, and joined both CCAS and the Central Coast Watercolour Society, Marlene's work went from strength to strength and she started teaching about four years ago. She enjoys seeing the transformation over a couple of lessons of people in her beginners' classes, often quite anxious at the outset, learning the techniques and proud in the end to have a completed piece to take home. Part of the secret, she said, is acceptance that there is no right or wrong, that no two artists are the same and therefore, while they all start out with the same subject and techniques, at the end of the class they will have 15 completely different paintings. She said she had found art just as fulfilling as she had dreamed, both the act of painting and quiet times alone, and socially, meeting and mixing with other like-minded people. "It really draws you in," she said. This year, Marlene is opening the CCAS workshop season with two sessions for all levels of experience on Wednesdays February 6 and 20. She will concentrate on wet-on-wet to create dramatic skies and landscapes, which she says are a favourite subject for her. To find out more about the workshops (cost $25 a week including morning tea) go to artcentralcoast.asn.au. You don't have to be a member to take part. To see more of Marlene's work go to marlenepalagyi.com.